Imagine being invisible! It would be pretty cool so I was intrigued by the premise of Transparent. It was a light and easy read that I found myself really engrossed in. When an anti-radiation drug was created wide spread genetic mutations occurred and people obtained unnatural abilities, our main heroine Fiona McLean is the only known person to be born with the gift (or curse) of invisibility. She has no idea at all what she looks like which has caused her to feel isolated and alone. She is also used as a pawn in her crime lord fathers illegal trading and used to mainly spy, hurt and steal when the need arises. Fiona was a likeable character with normal teen angst and fears so when an opportunity came to flee her father’s reigns in Vegas with her mother in the hopes of leading a normal life, she ran with it but she never truly believed she would ever be free and was always waiting for her father to arrive to make them return home so she could do his bidding. Being free gave her an opportunity to attend school, make new friends and potentially have a boyfriend – things she never thought possible. Transparent is written well and the overall concept is interesting, the world-building was simplistic and easily understood and I found the plot to be fascinating and fun despite a few minor inconsistencies; Fiona was on the run from her father but it didn’t make sense she would need to hide because she was invisible; I also would have like more information about the abilities and differing mob syndicates. There were a lot of characters in this book but they each had their own unique personality traits; Fiona’s father played the perfect villain – his ability of charming/persuasion by releasing a pheromone was pretty neat, I adored best friend Bea and her family dynamic; her brothers were lots of fun, I also came to really like brothers Seth and Brady Mitchell as well as Fiona’s own brother Miles. Older brother Grant on the other hand was shady and I never knew whether he could be trusted, his brute actions never quite endeared him to me. Speaking of Seth and Brady, these guys were Fiona’s love interests; I found her to be a little fickle with her feelings towards these guys – one minute she was crushing on Brady the next it was Seth, I got confused who she really liked so I never really appreciated the romance, I felt it was more something new for her so she went with it. Romance definitely wasn’t at the forefront of the story though. One small thing that grated on my nerves was Fiona’s treatment of her mother, she knew what her father could do with his ability but when her mother upped and left with her she never trusted her to form her own thoughts and actions and treated her poorly because of it – it was a tense relationship that I didn’t find was truly warranted, there was no trust or communication. Overall, Transparent was a light, enjoyable read and I love that it’s a standalone so everything is nicely wrapped up at the end. There were a few twists and turns I never saw coming and great characters to keep the story entertaining. 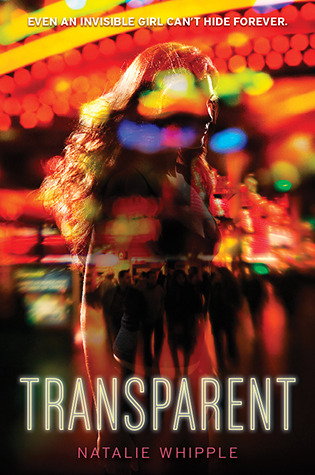 I would definitely read more books by Natalie Whipple; Transparent is a great debut novel. Thank-you to Harper Teen and Edelweiss for providing me with a copy of Transparent to read and review. About the author: Natalie Whipple, sadly, does not have any cool mutations like her characters. Unless you count the ability to watch anime and Korean dramas for hours on end. Or her uncanny knack for sushi consumption. I've heard such great thing about this book. Happy you enjoyed it too. can't wait to read it. I think this is going to be interesting to read. Hope I get to it soon. Great review. I am glad you enjoyed it. I don't think I've heard of this one - I don't know what to think. lol I keep wondering how she can have boyfriends if she's invisible. :D The concept is very cool though and I'm so, so glad it's a standalone. Very nice review, now you have me thinking about it. How do you kiss and make out with an invisible girl? I've heard some mixed things about this so I'm glad you ended up enjoying it even with the flaws. I have a copy on my shelf and I look forward to reading it one of these days. I am glad you enjoyed it, I skipped this one because I read Invisibility from David Leviathan and kind of felt they would be too similar. Awesome review Sharon! Thanks Kimba :) I really want to read Invisibility - I agree they do sound quite similar though. I am glad you enjoyed this. It sounds really good Thanks for the great review. I love the idea of being invisible but I didn't really like the way it was handled in this book. I also want to check out Invisibility to see if that's more to my taste.